Share the post "Labor Day Weekend Open House Specials"
Holtz Realty is hosting four open houses this weekend and each one of them are great values for their price ranges. 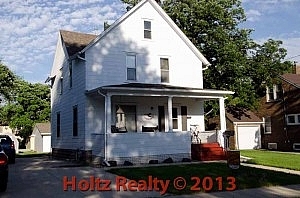 The second Open House is at 1114 S. Federal Ave., Mason City, IA tomorrow afternoon (Saturday) from 1:00 pm to 3:00 pm. This 2 bedroom ranch has had nearly everything done to it that you can imagine. It offers newer roof, newer siding, newer windows, newer furnace and air conditioning, updated wiring, hardwood floors and a delightful open floor plan. I was just mentioning to someone today that I haven’t had a listing in that area all these years that hasn’t sold because the people that live there, like the area. It’s sort of one of those tucked away neighborhoods that you just sort of forget that even exists. The asking price on it is $76,900 You will like this one. 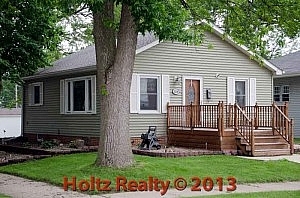 The third Open House is at 945 N. Delaware Ave., Mason City, IA tomorrow afternoon (Saturday) from 1:00 pm to 3:00 pm. 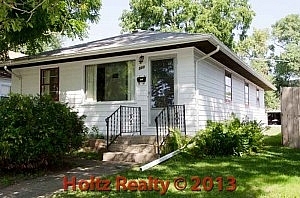 Without a doubt, this Wells Fargo short sale is as far as I’m concerned, the best buy of the year in Mason City. This 3 bedroom home was built likely for an up and coming family in its time because of the extensive amount of oak woodwork and room sizes. What I can’t believe is how so many buyers don’t see the core value of this home. It has 3 large bedrooms, a generous sized kitchen, big living and dining room, grand front foyer, semi-finished basement with ¾ bath, and to top it all off, it offers a nearly new 2 ½ stall garage on a PAVED alley. After numerous reductions, the price is now a meager $59,500. Now that’s a buy. 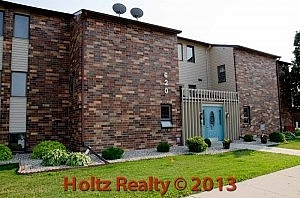 The fourth Open House is at 620 Briarstone Drive, Unit #28, Mason City, IA on Sunday afternoon from 1:00 pm to 3:00 pm. This 2 bedroom walk-out condo has been meticulously cared for as well as updated by the current owner. What is so special about this unit is that it is an end unit which provides more natural light into the rooms as well as the charming private covered patio that speaks of morning coffee time watching the waterfowl on Briarstone Lake and evenings spent cooling your toes in the water off the dock. There is a garage that goes with this unit as well. I was so impressed by the views when I listed it, I actually didn’t want to leave! The asking price is $109,500 Be sure to stop by…you’ll be glad you did.